The OpenXR working group has been chaired from the start by Nick Whiting from game & engine maker Epic Games. Citing additional responsibilities in his role at Epic, Whiting tells Road to VR that he stepped down as chair in late 2018, though the company is still fully committed to OpenXR. Taking over as Chair of the OpenXR working group is Brent Insko, Lead Software Architect at Intel’s Virtual Reality Group. Inkso has been part of the group since its inception. 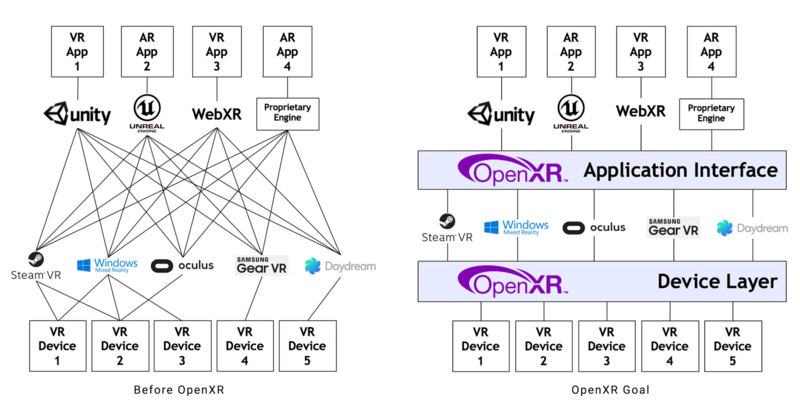 In August 2018, members of the OpenXR working group presented a detailed overview of the OpenXR architecture. The group also showed the first live demo of OpenXR in action. Built with Unreal Engine using an OpenXR plugin, Epic’s ‘Showdown’ demo, was shown running on both a Windows Mixed Reality headset and a StarVR headset. 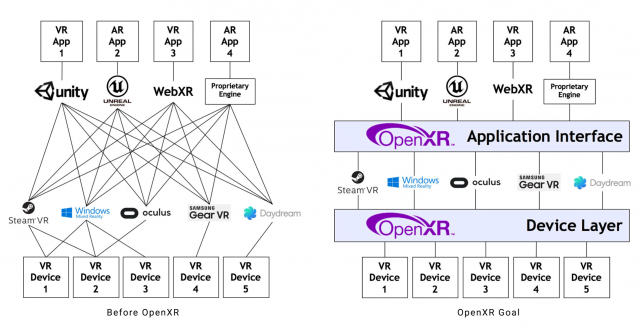 This showed one of the core elements of OpenXR: that developers can design their applications around a single API, and have it run on multiple headsets without dealing with multiple vendor-specific APIs. 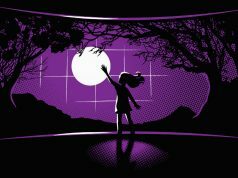 Conversely, a hardware maker targeting the OpenXR standard could count on the ability to tap into a body of existing OpenXR content, lowering the barrier to entry into the market, and expanding choices for consumers. “Our Showdown demo running on OpenXR with Windows Mixed Reality and StarVR headsets was just the beginning, and we remain fully committed to OpenXR as the defining open standard for XR,” Epic’s Nick Whiting tells Road to VR. 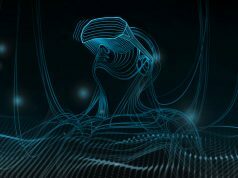 Indeed, Intel’s Brent Insko says that the OpenXR working group plans to provide a progress update on development of the standard at the Khronos Developer Day on March 19th at GDC 2019. Their diagrams are not well made but this standard is essential. Can’t wait for it. Honestly? I think this specific standard is a bad idea. It adds two more APIs to the path, and it reminds me of the early days of Win95, when we started adding APIs to abstract away the details of sound and graphics adapters. DirectX seemed like a godsend, but that solution ended up with a stack of APIs that rendered low-latency operations difficult or impossible, and we introduced new APIs to get around those limitations, regain hardware access, and work at a lower level again. Right back to square one, only there’s now a couple gigs of extra code involved. We don’t need extra APIs wrapping around and abstracting the currently existing ones. We need a replacement API that is accepted as a standard by everyone. Basically, the two purple blocks need to be one purple block, and the pile of logos between them needs to vanish. That gets us to where we’ve been with keyboards and mice and displays for years and years. There’s no two-gig abstraction layer to navigate diffrences between Logitech and HP mice. You plug it in and it just works, because they all speak the same language at all levels. The entire purpose of OpenXR is to eliminate the current state with additional API shims between OVR/SteamVR/OpenVR/etc by switching everyone to a common API. Different applciaitons, runtimes, drivers etc can all interface by that common API. 3. If you are a user, you just plug your device and it works. Like mice, keyboard etc. Secound point is where HTC, Oculus, Windows MR need to handle input (Application) and output (Device). You can’t exacly make it more condensed because each company have it’s own optimalization solution for their specific hardware, but they are expected to use universal API. In the end you do have different hardware, different tracking systemss, controllers. Unless application uses specific functionality of single headset, it is expected to work the same on all with this API. You think the chair position is meaningless? This isn’t the president sweetheart. It will be interesting to see whether or not Oculus continues down the path of hardware exclusivity and re-introduces the “entitement check” or some critical unsupported extension once this standard is widespread.